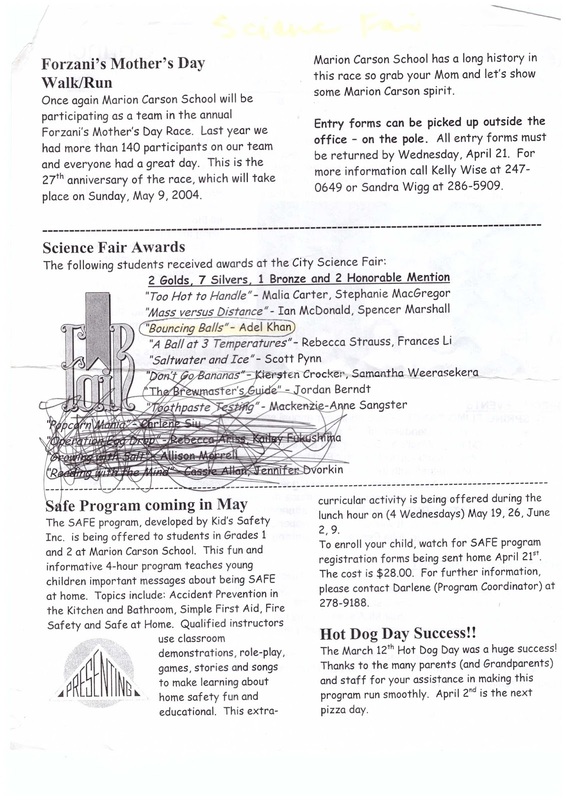 When we last left off the events of the Science fair had ended. Soon I would be experiencing two life-changing events in June. The first was that my dad would be working in Kuwait, where he had previously worked. The second event was that my tenure at Marion Carson Elementary where I had spent six sensational years was nearing the finishing mark. Over the course of time, I was taken by surprised once June had approached. A sample of my recreation of Barks' cover to "Lost Beneath The Seas' (1964, US46) done in this time. The previous night Ian phoned me asking if I would be interested in working together on a book report. I jumped at the opportunity when he asked if I would like to partner with him. I was giddy working with Ian on a project because he usually partnered up with Spencer. 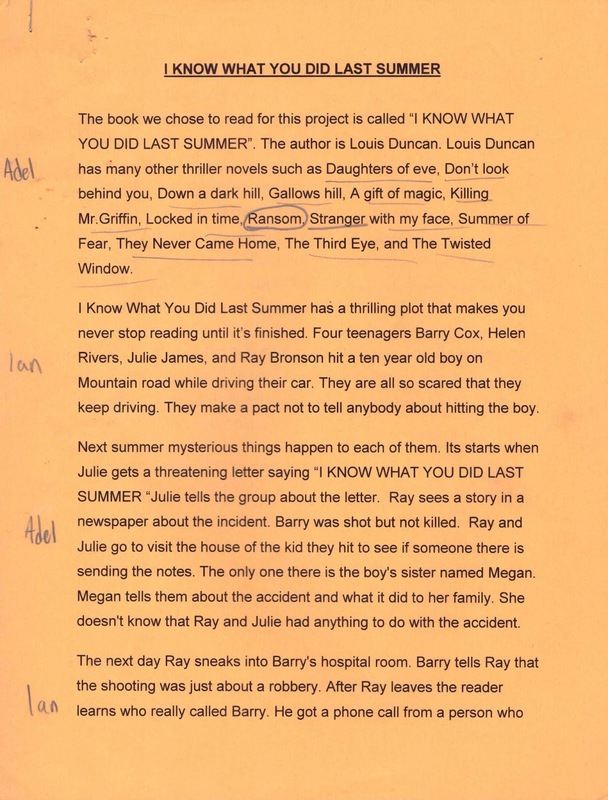 He told me the book we would be reading, “I Know What You Did Last Summer” by Lois Duncan. Immediately I phoned Chapters in Crowfoot if there were any copies of the book available. Unfortunately, there were none over there, but many were in Dalhousie. The following morning, I stopped by the Dalhousie Chapters and picked up a copy of “I Know What You Did Last Summer” en route to Marion Carson. I arrived a bit late when my class was finishing watching “Mulan” in class. Mr. Pugh allowed us to read our novel wherever we wanted. Ian and I chose our spot which was the corridor outside the classroom. We would read up to a certain point then we horsed around. During recess Ian and I were shooting hoops and he was wondering why I laughing. I told him how the previous night I joined my dad when he was viewing an episode of FAMILY GUY, where Peter was watching Bert as a drunkard cop, and Ernie as his life partner lying in bed. Bert was woken up by a phone call reporting an attack at Hooper's, at which point after getting up, he and Ernie get into a quarrel with each other for the former drinking, and the latter eating cookies in bed. It was hysterical seeing characters you grew up with in your childhood in adult situations. Soon Ian was giggling at the cutaway gag of FAMILY GUY I described. He commented how I was lucky to have a dad to expose me to all of these shows.I was a regular viewer of THE SIMPSONS, but I felt the early seasons of FAMILY GUY pushed the envelope similarly as THE SIMPSONS did when it started. In order to live in the moment, I put the thought of my dad leaving out of mind as much as possible. I was involved with completing school assignments I didn't have time to worry. The weeks leading up to his departure were memorable. He would pick me up from school, and occasionally drop off Ian and Spencer to their homes. It was business as usual, as he helped me prepare for the grade six provincial exams for Science, Math, Language Arts, and Social Studies. As a passenger, I strapped myself in while my dad the pilot took me to the soaring heights of aerodynamics. I was frustrated with how the rest of my classmates were easily making paper airplanes, while I was struggling to make one. Later that day, my father assisted me in making paper airplanes by following directions in a book. In due time I perfected the plane making process without looking at instructions. I learned that by folding the ailerons of a paper plane made it loop de loop. When we would run laps starting from Marion Carson Elementary to the outskirts of F.E.O, I would have a burst of speed mentally hearing “Pop Goes The Weasel” in my mind. I eagerly looked forward to borrowing the “Curly Classics” DVD with my father after school finished, so I could finally view “Punch Drunks”. I was familiar with the premise of the short and I had seen snippets of the short. 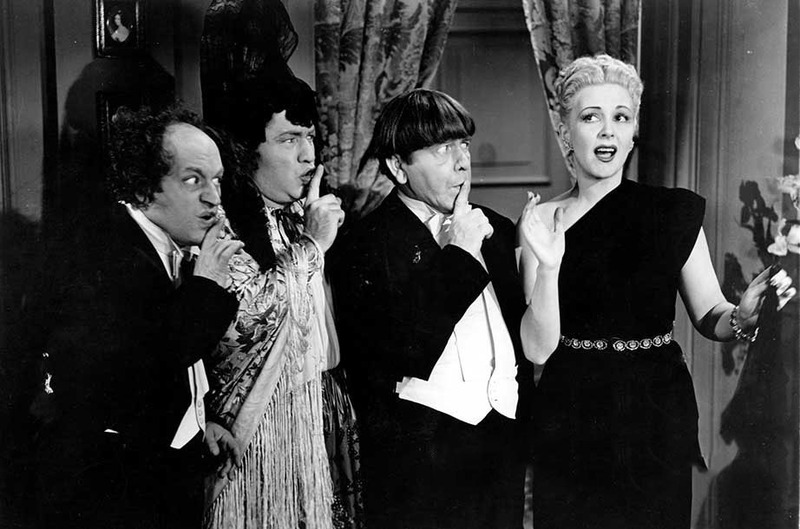 I remember how enthusiastic my father was in waking me up early on weekends when The Three Stooges would air. It was loads of fun watching “A Plumbing We Will Go” again. I loved how Moe, Larry, and Curly escaped from the law. The best part was when Curly, trapped in his maze of pipes uses a brace-and-bit to let the water run out, which leads to the floor to collapse and dismantle the pipe Moe had fixed (Yeah, who said you need brains to be a plumber?). Another entry “Micro-Phonies” (1945) which I hadn’t seen in some time was a favorite among my father, sister, and I. Curly’s expressions as he lip-synched to Christine McIntyre's performance of “Voices Of Spring” was a highlight. Señorita Cucaracha attempts to silence Alice Van Doren (Christine McIntyre) from vocalizing. Curly appealed to the inner kid in me with his high-pitched voice, unique mannerisms of singing “Laaa-deee”, and vocal expressions (“Woo-woo”, “Nyuk-nyuk”) or as I coined “Curlyisms”. I saw the joy he imbued in all of his performances, especially if he was dancing. The last day when we were learning dance moves in our physical classes, I spontaneity dropped to the floor and spun like a drop. Had I been in grade seven, I would not have the courage to do it, as I was inhibited by my classmates’ perceptions of me. When I watch his shorts, I learn that it is all right to feel frustrated when situations that our beyond our control. Sometimes don’t we all feel like making a Curly-esque squeal, or slapping ourselves in the face and saying “I’m a victim of coicimstance”? In an unorthodox way it is an outlet of ridding the angst inside all of us. Towards the end of April when we were working on the book report, most of our time was spent listening to music that we introduced each other. One of my favorite songs Ian shared was “Le Tigre” by Decapton. We were hesitant about setting up the review, Ian looked at one of his old book reports and we based it off that. We had a dry run of our interview making sure that there were no awkward gaps when we presented in class. I borrowed my father’s tie in order to look like the part of the interviewer. I was Brian Linehan opposite Ian who was Barry one of the characters from the novel. Mr. Pugh told us that our book report was well delivered which made us feel content with our efforts. I was pleased that our project went well. I wanted him not to regret his decision of choosing me as his partner. Page One of the interview with Ray Bronson. 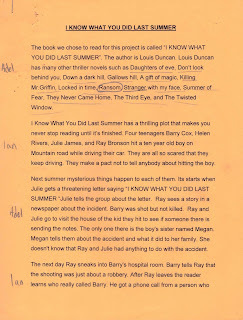 A script leading into our interview with author Ray Bronson. The first of two stories I had written "Land Beneath The Ground' where I cribbed a lot of Barks stories. In Language Arts, we were steadfastly preparing for the first part of the exam, which consisted of writing. 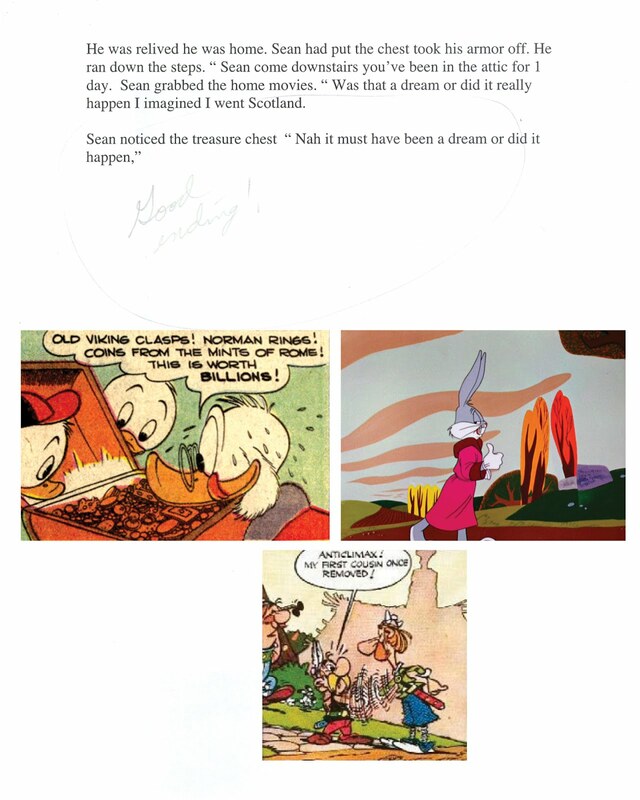 I constructed two tales that were pastiches of two Carl Barks’ tales “The Old Castle’s Secret”, and “Land Beneath The Ground”. In the first story, I used the trope of a character thinking that what he experienced was a fantasy. I had the ending of the Bugs Bunny short,” Knight Mare Hare” (1956) in mind as I finished the story. “The 2004 Stanley Cup” was an event that all of my classmates were excited about. A sample of my influences that I purloined when creating my story "The Old Castle's Secret". I recall how I was crushed upon hearing that my father would be working in Kuwait. In retrospect, it was an event that was a blessing. On Monday, May 31st as I would not be there to see my father off at the airport, because I would be embarking to Camp Kiwanis the following day. I was allowed to miss half a day of school. My family and I went to Chinook Mall in order to complete some errands. I was effervescent as ever standing in line waiting for payment. The feeling knowing, he was mine as the clerk put him in the bag. Among the Duck memorabilia, I possess it is what I treasured the most. It was a touching gift that my father purchased for me before he left for Kuwait. Acting as a chaser to the entertainment that night my mother, father and I first watched “All The Worlds A Stooge” and then “The Three Little Pirates”. In the first short we enjoyed the Stooges acting as children. The premise of the later short of the Stooges stranded on Dead Man’s Island and escaping from there was fun. We enjoyed how there were many precious gems in Curly’s performance. When they were entering the Governor (Vernon Dent) finds it hard to believe that the trio are actually sailors due to their modern uniforms, but changes his mind once Curly starts flirting ("Hiya, babe!") with his fiancée, Rita (Christine McIntyre). I was smitten by how radiant Christine McIntyre's appearance. I was amused seeing Curly as the bespeckled Maharajah of Canarsie, as he improvised his way of crossing his legs and sitting down at the table. As director Edward Bernds commented, “In Three Little Pirates, he was terrific. It was the last flash of the old Curly”. 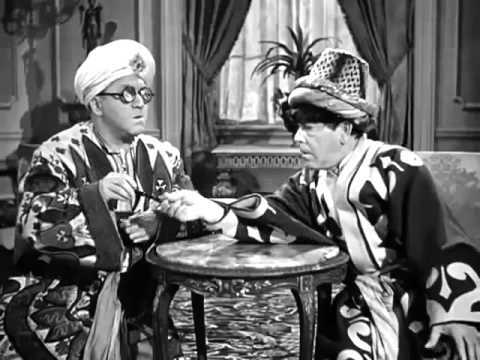 The infamous Maharajah routine between Moe (The Gin of Rummy) and Curly (Maharajah) was performed flawlessly between them. I enjoyed the doublespeak and gibberish traded between them. “I would like to see some babes myself” was among the one-liners that tickled me. I detected from Curly’s voice that it was strained, especially when he sounded off to Moe, “Aw. Shut up. I don’t have too”. I thought Canarsie was a funny sounding word. Later when I was viewing TOP CAT that I discovered Canarsie, Brooklyn was among the localities in New York. Ain’t it interesting what you can pick up from watching television. The infamous "Maharaja" exchange between Moe and Curly was previously performed in TIME OUT FOR RYTHM (1941) featuring Allen Jenkins who voiced Officer Dibble in TOP CAT. Before we went to sleep we read “Cave Of Ali Baba” (US37) from Abeville’s treasury of Scrooge stories. The whirling dervishes that appeared, and the nephews fantasizing about Jinns leaping to and fro were the references to Arab folklore that I lapped up. The terrifying Rocs that grabbed the Ducks off into the air was thrilling. 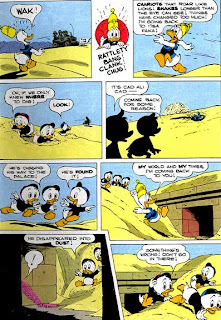 I always thought the Rocs were a creation that Carl Barks devised. Later I discovered they were from “1001 Arabian Nights”. My dad mentioned how the story took place in Iran. It was fitting how the night prior to the first day of grade six started we read, “McDuck Of Arabia”. The day before I left we read “Cave Of Ali Baba”. The stories were both set in the Middle East. 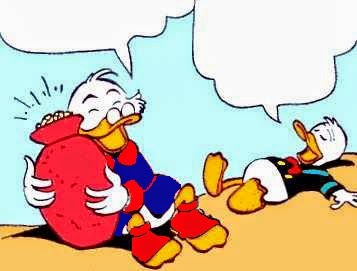 Uncle Scrooge clasping onto what he believes is a jugful of rubies. The next day, I remember in the courtyard of “Marion Carson Elementary” were parents of all the students. My parents were conversing with Ian’s parents. It was a bittersweet moment as I sat in the bus departing for “Camp Kiwanis”; I looked out the window seeing my father and mother among the sea of parents. 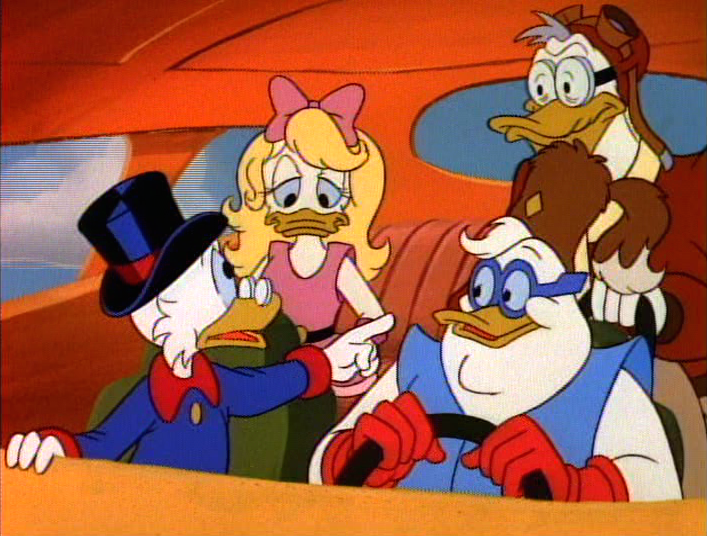 I pretended as if I was one of Donald’s nephews embarking on a trip to the Junior Woodchucks. Coincidentally when we were preparing for our trip, we were making our “nature names” using wooden pieces from a tree stump from Mr. Pugh’s backyard. Woodchuck was my nature name. It as extremely informative learning about nature, and later we would play games like Capture The Flag, Tag, and many others. I remember one of the counselors made mention of the film “Cool Runnings” (1993), I was ever so interested in it starred my favorite comedian the late John Candy. My sister picked me up from “Marion Carson Elementary” on Friday, June 4th. On the way home, Madonna was playing in the car, listening to the song “La Isla Bonita” I imagined Donald out on the terrace while Daisy was on the balcony in Spain. When I entered the house it was hard to imagine that my dad was not there. it felt strange when I talked to him over the phone. I was melancholic throughout the evening. 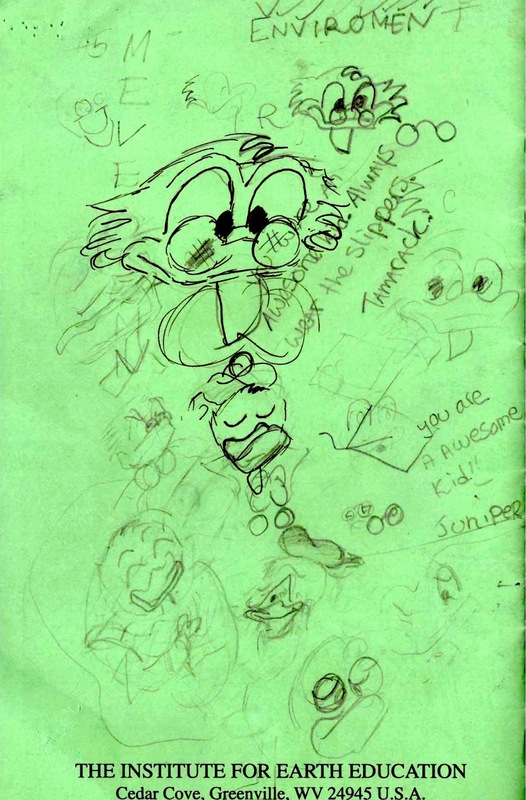 My renditions of Barks drawings surround autographs from my camp counselors. After a week of being disconnected from technology, I looked at the issue of “Scoop” online. The section “Industry News” offered a glimpse into the latest Disney comics that were released. When I saw Branca’s vibrant cover for “Uncle Scrooge” I was sure that I wanted to pick it up. Before I slept, the thought of picking up issue #330 of “Uncle Scrooge” at “Comic Kazi” made me look forward to tomorrow. I always welcomed Barks’ reprints, as I had never collected his stories before. It started a long-term coping mechanism where my spirits soon lifted after perusing an issue of “Uncle Scrooge”. In class when we would start our silent reading sessions I would pull out issue #330 from my desk. I would let my friends Ian, Spencer, and Jerry read it when I finished it. 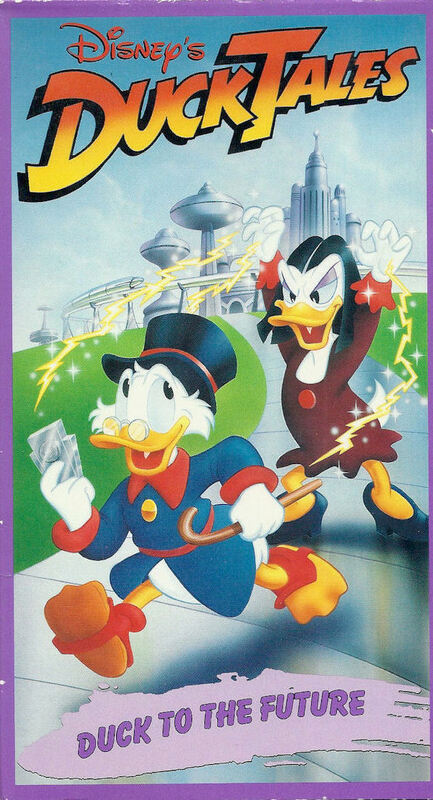 I was hooked after seeing Daniel Branca's inviting cover for Uncle Scrooge #330. The first issue of Uncle Scrooge to be picked up during my dad's leave. One afternoon in class we were constructing tie hangers for a Father’s Day present. In the process of completing mine, I had completely lost my nerve; I started sobbing about how my father was not there. Usually, I always maintain my composure, but in this instance, I had lost it. I remember Ian chucking a screw while saying, “Screw you” at those who were laughing at me. I felt grateful for him standing up for me. I hoped that the screw did not injure anyone’s eye. Friday, June 25th marked the last day of grade six. I bought my mom’s camera and took pictures of my friends and Mr. Pugh. 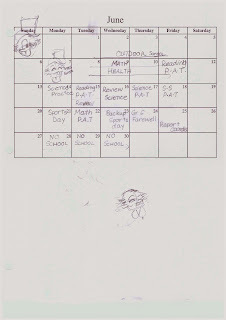 Summer was a time where every student eagerly looked forward to - not me. My father not being there, and Ian and Spencer vacationing in their cabins in Invermere, a community of B.C. left me feeling lonely. Ian and I bid farewell to Marion Carson Elementary and look forward to the future. 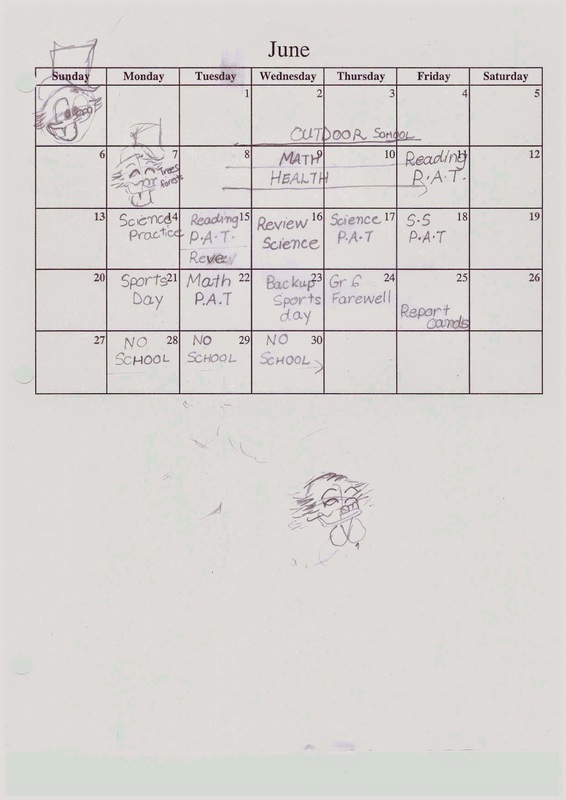 The schedule for June 2004 shows a secession of review sessions and Provincial Exams. When I said farewell to Ian and Spencer as they were walking home, the realization that I wouldn't be seeing them for a while didn't hit me until a week later. In my mind, I was content with spending my summer with the Disney characters as the back cover from "Vacation Parade" displays. The first week of summer was spent recovering from a cold! I had a fever during the warmest days of the year. In the afternoons, I watched episodes mainly from the fifteenth season of THE SIMPSONS that aired on FOX (Channel 22). After THE SIMPSONS, THAT '70s SHOW would air. The premise of the sitcom—a decent if occasionally geeky kid named Eric Foreman (Topher Grace) who spends much of his teenage existence in Point Place, WI during the 1970s “hanging out” with his friends in his basement. Rounding out Eric’s “gang” were high school sweetheart (Laura Prepon), best friend, Hyde (Danny Masterson) comes from a troubled home, Michael Kelso (Ashton Kutcher) is the handsome idiot, spoiled rich girl Jackie Burkhart (Mila Kunis), and Fez (Wilmer Valderrama) the ‘foreign guy’ whose nationality is never revealed. Viewing THAT ‘70s SHOW was an escape, a way for me to feel that I wasn’t alone. The series was a time-capsule that captured the nostalgia with appropriate music, clothing, hairstyles, references and the like. On weekdays back-to-back episodes followed THE SIMPSONS on Fox (Channel 22): On weekends it aired on Global (Channel 7). I caught up on all six seasons of the show prior to the seventh premiering in the fall. I was drawn by the relatability of the characters in the show. To quote Topher Grace, "If you lived through the 1970's or even just survived being a teenager, one of these characters could be you." You could substitute Eric's geeky obsession for Star Wars with mine for the Ducks. As an introvert, it was watching Eric's dynamic with his friends I was able to experience what it was to be a part of a clique. The fantasy sequences where the kids would do twisted interpretations of pop-culture be it: “The Three Stooges”, “Reefer Madness”, and “Grease” was a highlight. How the other characters would comment on the fantasy sequence reveled in the meta-humor I appreciated. I wondered where had this show been all my life. In previous grades, the show had not caught my interest. I, recall in gym class Jamie Hoffman mentioned one of the characters, Kelso. I started viewing the show when the last episodes of the first season were being re-run and became “hopelessly addicted”. One of the earliest episodes that stood out was, "The Garage Sale". I was naive to understand that the ingredient in Hyde's "special brownies" was marijuana. It was humorous seeing Red as "high as a kite" especially when being lectured by Hyde and Eric about who Red sold the Vista Cruiser too. I was inspired in whipping a batch of brownies as Hyde did. I would ask my mom, what the "special" ingredient in the brownie recipe was. She responded, love. I, replied with my favorite line of Hyde's, "there's a whole big bag of love in there". When I was feeling down, I went to Blockbuster to rent “The Three Cabelleros”, because it featured “Don’s Fountain Of Youth”. 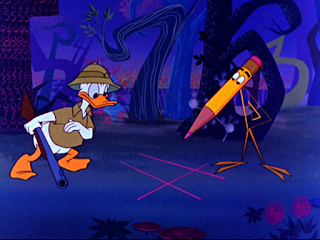 The Florida everglades was the setting for one of my favorite DUCKTALES episode, “Sweet Duck of Youth”. The nephew’s eyes being glued to a comic book seemed out of character when compared to Barks’ stories, but then I disregarded that as the nephews could be occasionally mischievous. Donald as an infant tear up the nephew’s comic book was retribution for when Donald took their comic book and they started crying. My mother and I enjoyed the part where one of the nephew’s reprimands Donald lightly on the hand for ripping up their comic book, and immediately wails. The end where the baby alligators tear up after Donald has left only to be reassured when their actual mother quacks was cute. Saturday, July 3 I went to Comic Kazi to pick up this year’s issue of “Free Comic Book Day”. 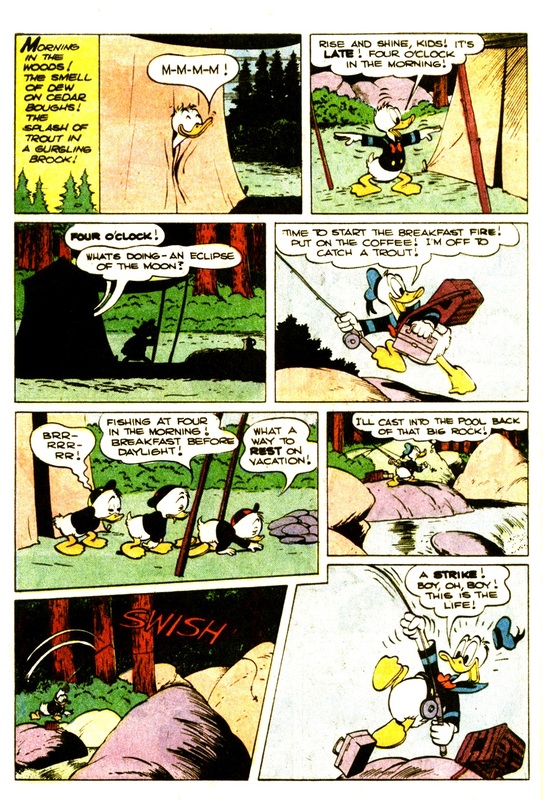 Gemstone offered reprints of two Carl Barks tales: “The Riddle Of The Red Hat” and “The Second Richest Duck”. The “flip cover” was an ingenious method of reading the stories from front to back. You could read the stories with the covers that originally accompanied them. Finally, my comic book retailer had received “Vacation Parade”. It was the first comic book that I purchased with my debit card. When I went to bed that night I read the annual, which led off with Carl Barks’ classic “Vacation Time”. There was an unhappy camper that spoke with a Brooklyn dialect. I “mentally heard” Hal Smith provide his voice. I felt tuned in to the peril that Ducks faced when they were in the forest fire. It was ingenious how Donald dug trenches for him and the nephews and wrapped wet shirts around their face in order to prevent suffocation. 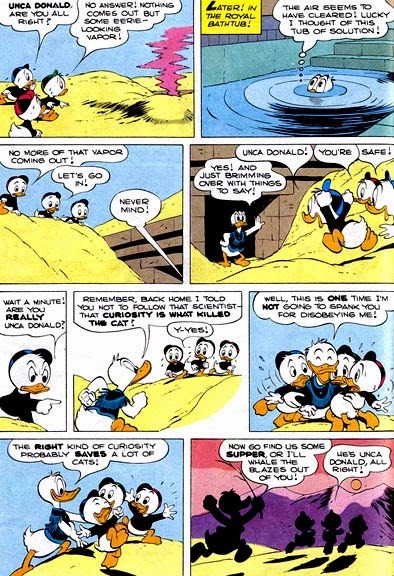 I liked how Donald was not portrayed as a bungler, however as a protector for his nephews as they were in the midst of a fire. The beautiful forest scenery made for lovely vistas and crackling flames evocative and real. The smoky skies, the trees now were blackened stumps, and the murky water beautifully illustrated the grave reality of the once was a lively forest. Donald inhaling the smells of nature outdoors made me feel as if in that atmosphere. 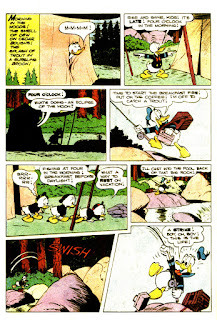 The enthusiasm that Donald displays about waking up early on summer vacation and the bleary-eyed nephew's reaction echoes the feeling between my father and I. Carl Barks experimentation of panel added to the uniqueness of this story. The story that followed it was Paul Murry’s “Mickey Mouse and The Whale”. The opening panel of Mickey and Goofy walking down a pier on a hot summer’s night, then being shanghaied aboard a ship by the villainous Captain Blow and his accomplice, Peg Leg Pete was suspenseful. It was a surprise how Minnie came on board the ship. The part where Mickey, Minnie, and Goofy were pulling the whale’s teeth looked realistic. I could imagine the pain the whale may have suffered. The red coloring was a good touch to indicate the soreness of the whale’s tooth. The style in which he drew the Mouse looked appealing. One day I was helping my neighbor with some chores. On the way from completing a task, we went to a video store because he had to return a film. I was perusing the aisles to see what videos they offered. I saw a video of THE JETSONS. I was tempted to rent it one day, but I had a perception that the animation would have been off model. When I later watched the original run of THE JETSONS the animation was consistent. 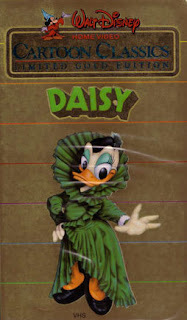 On the bottom shelf of the racks, there was a video cassette that attracted me... it was entitled “Daisy”. I had seen the cover art online, but I could not believe I was holding it. The next day, I went tutoring at Sylvan Learning, then I hit a round of golf balls at Bearspaw, and finally, I rented “Daisy” from the store. 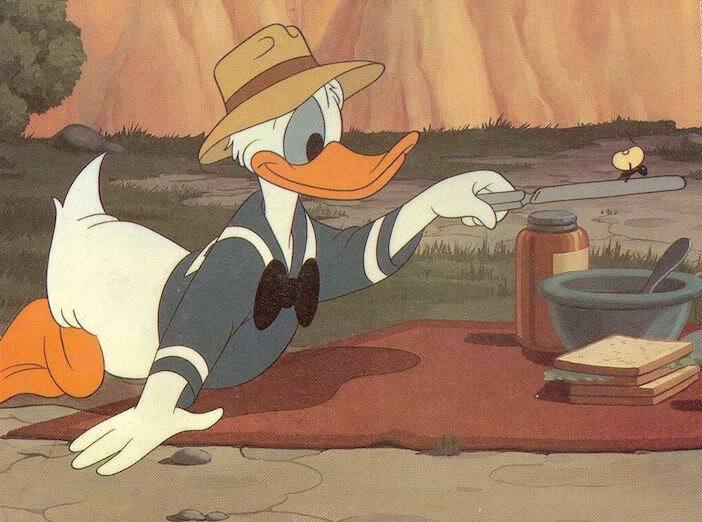 Out of all the cartoons on the tape, “Donald’s Dream Voice” (1948) was one of my favorites. The animation of Donald dancing before he was selling his brush was nice. It was touching when Donald sat dejectedly, with his sulking shoulders as he explained to Daisy his inability to sell brushes. Daisy comforted him with a kinetic kiss, which sent him to do a backflip onto a recliner. The delicate gestures of her eyelashes swooping impacted how heartfelt the scene was. From there he hung onto a chandelier he slid onto the banister as she tossed him his briefcase. The underscore and the “plinking” sound effect as Donald rampantly retrieved the pill worked well. The closeness between Daisy and Donald has been seldom explored in the cartoons. I developed the plot of Donald as an unsuccessful salesman further. When Donald then peddles furs door to door, he then tries on a fur of a loup-garou. Immediately he becomes successful in his relationship with Daisy. At night he transforms into a loup-garou and terrorizes citizens of Duckburg. When Donald discovers all of the damage he has caused he cries. I had dumped the plot when I couldn't develop it any further. 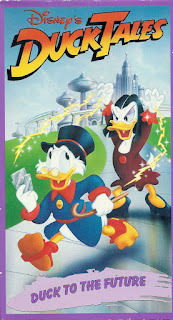 The following week when I went to return the video, I made two more discoveries – “Mickey’s Christmas Carol” and “DuckTales: Duck To The Future”. The videos made for a delightful ducky hour of entertainment that afternoon. 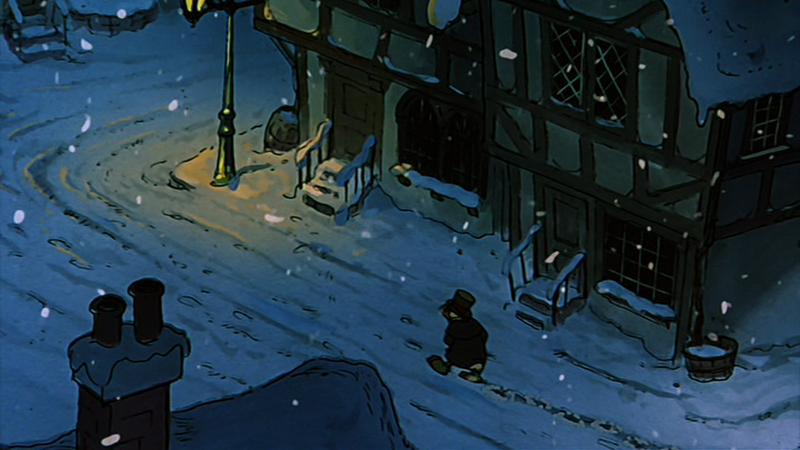 “Mickey’s Christmas Carol” was a special that I would never tire of viewing. Each Christmas, I would regularly watch it along with “From All Of Us To All Of You”. 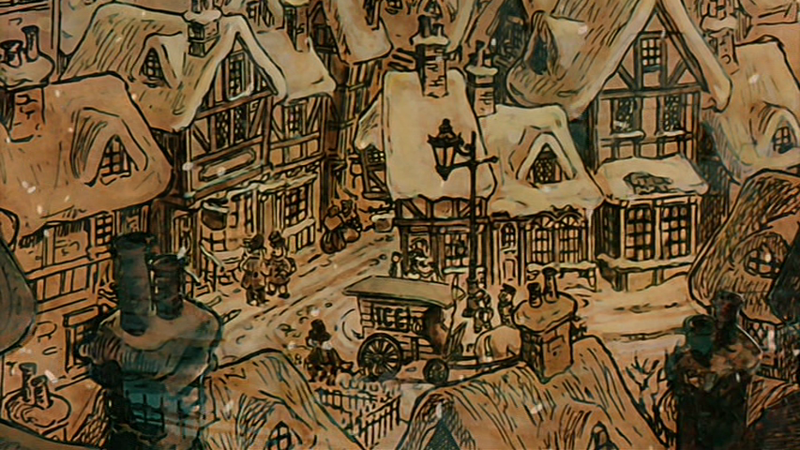 Hearing the haunting song “Oh What A Merry Christmas Day”, accompany the sepia-toned illustrations put me in the Christmas mood. 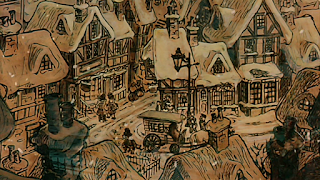 The backgrounds captured the style of Victorian England. 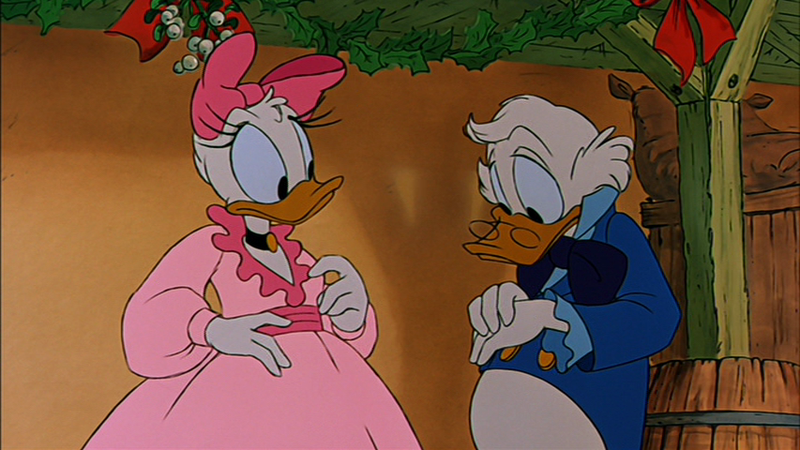 A sequence that delighted me was when the Ghost of Christmas Past (Jiminy Cricket) takes Scrooge to a Christmas party hosted by Mr. Fezziweg, where he met his fiancée the enchanting Isabelle (Daisy Duck). 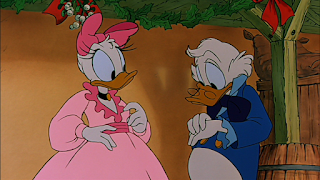 Before they were to dance, it was a cute moment as Scrooge coyly held his hand while he exchanged glances with Daisy. It was a great pleasure seeing the two interact. I was always bothered by her inclusion from the DUCKTALES cast. The upbeat underscore as they danced conveyed the gaiety of the atmosphere. It was a clever way of incorporating cameos from a menagerie of Disney players. 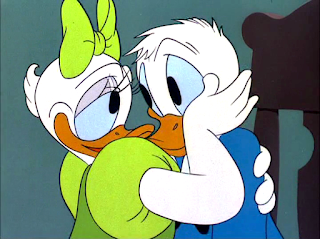 After their romp she pecked Scrooge on the cheek, the animation showed his eyes dilating was a good touch. 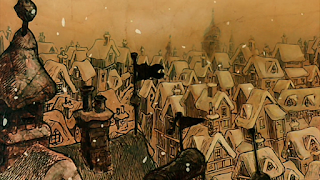 A great angle captures the dreariness as depicted in Dickens novel. 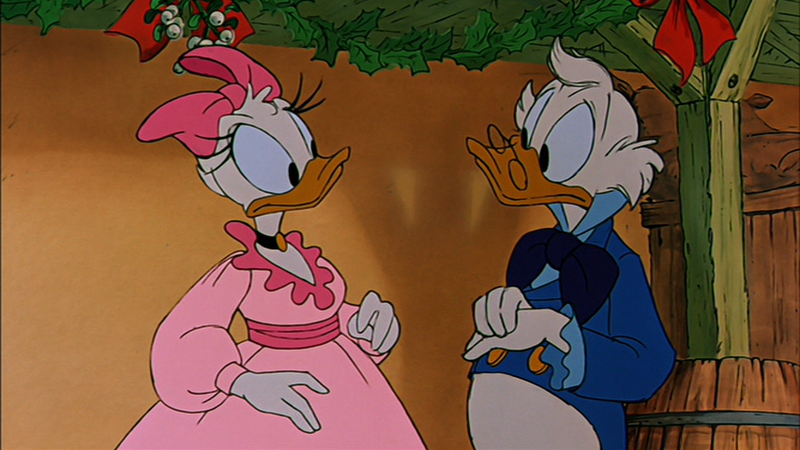 I like the glance a young Scrooge gives Daisy. Later that day, “Canadian Road Trip” an episode of “THAT ‘70s SHOW” aired. It was a surprise seeing SCTV alums Joe Flaherty and Dave Thomas as the Canadian Mounties. As a child, I had seen them paired as the Sleeze Brothers who take Big Bird in FOLLOW THAT BIRD (1985). Despite the typical Canadian stereotypes displayed it was extremely humorous. The subplot of Red adjusting his VCR in order to tape Roots was fun. "The Se-DUCK-tion Of An Innocent Youth"
I, like many of the students, was anxious returning to school from the comforts of staying at home. There was the impending science fair project that I delayed over the break. The most I could do was how I would layout the tri-fold. Where would I glue paper and paste it on there? It reminded me of when the Three Stooges were paperhangers or Donald in one short decorating his house with wallpaper. 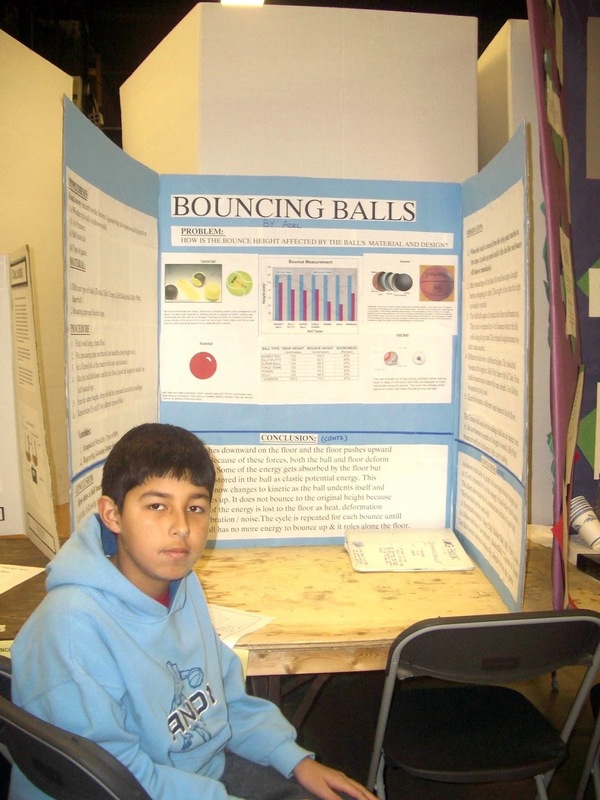 Once again it was my dad at the helm of my science fair project. We bought a book listing the numerous experiments. I felt it would be fun conducting if the bounce of a ball depends on the type of ball. Among the feeble ideas, I jotted down about possible science experiments. My dad when explaining me potential and kinetic energy, relayed it with an analogy of Curly at the top of the stairs which demonstrated potential energy, as his body was at rest. He said if Curly were to tumble down the flight of stairs that would demonstrate kinetic energy because his body was in motion. He then drew a picture of a set of stairs with Curly falling down accompanied with his sound-effect “Woo-woo-woo”. When I saw that drawing that interested me. During this era, I watched repeatedly Donald's "antagonizes" a series of ants in "Tea For Two Hundred" (1949). As politically incorrect as it was to have the ants depicted as African Americans it was humorous. My favourite part was when the ants throw Donald over the cliff. Beautiful backgrounds from Thelma Witmers and Oliver Wallace music added to what was to have been a serene outing in the mountains for Donald. Once again we were learning how Canadian elections were held. Ian, Spencer, Jerry, other classmates and I created our own party, “The Ghostbusters”. I was in charge of creating a poster and a political announcement. I recorded a political announcement over Ray Parker’s 1980s hit “Ghostbusters”, as his song included the lyric “Who ya gonna call” which suggested we were the party to elect. I recreated a poster of “The Ghostbusters” insignia using markers and pastel. When I bought the poster next day in class, Ian was surprised by how well it looked. Friday afternoon I went downstairs to the library in order to do some research for an assignment. I was in the middle of reading a book when I heard a familiar sound; upon further inspection, it was Clarence Nash as Donald Duck and Paul Frees as the Narrator. 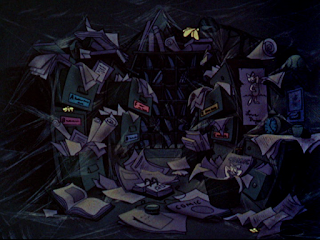 I could not help myself from looking into the classroom where students were watching “Donald Duck and Mathmagic Land”. I did not want to make it look obvious that I was looking into the classroom so I headed upstairs. 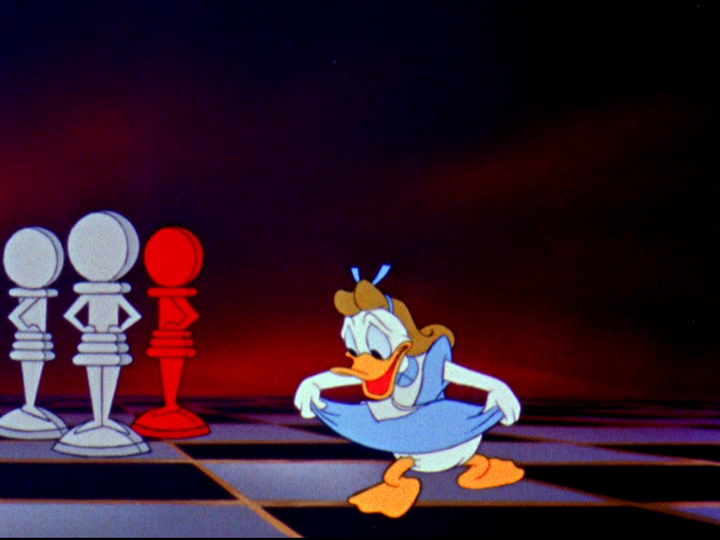 The scene where a distraught Donald observes his transformation into Alice of Wonderland fame is the moment I saw the film. I was always excited to play “Capture the Flag” with my classmates, on the “Marion Carson Elementary” soccer field: A perfect topper to the end of the school week. In order not to get trapped by the opposing team, I devised a clever way of maneuvering around them. I would quote the promotional texts from issues of “Uncle Scrooge”. For example, on the cover of issue #62 “Yeeks! Advance To The Rear! IT”S THE QUEEN OF THE WILD DOG PACK”. Classmates would give me a puzzled look as to why I would say that, but that did not matter to me. It served its purpose of distracting the opponents. I madly maneuvered around them. When one classmate was close to catching me I said, “I was the Cannon on the Wabash Cannonball” as I ran rampantly from their clutches. You are probably wondering where I had come across this quotation. 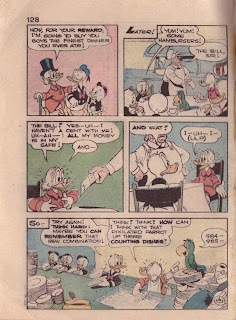 A couple of days earlier, my friend Joey had lent me his issues of “Uncle Scrooge” (285-297) that printed “The Life And Times of Scrooge McDuck”. 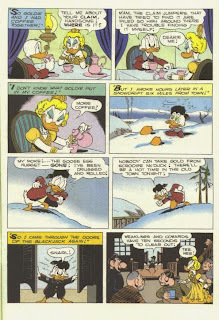 Each installment of “Life and Times” would be accompanied by a commentary where Don Rosa explained the historical events he used or references that Carl Barks inferred to about Scrooge’s past. 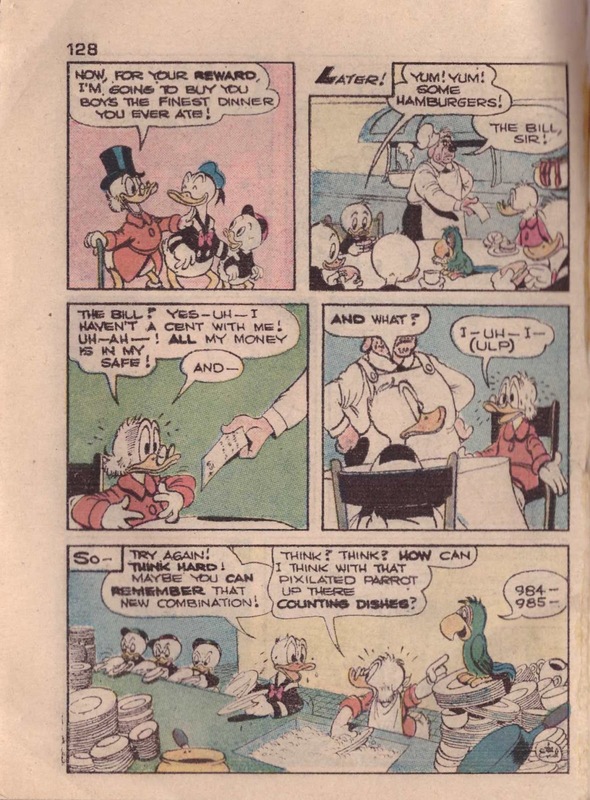 Therein would lay panels from “Uncle Scrooge” stories. It was a treat for me, as I had not read most of his adventures. Don Rosa did a gargantuan feat of using the few references that Carl Barks made to Scrooge’s past and create a great series. I had a better appreciation of the battles Uncle Scrooge triumphed over when he was attaining his fortune. We were introduced to his family – his parents, uncle’s, and sisters. When I returned to class that Monday. I was working at my desk when I saw Mr. Pugh pushed a TV trolley in the classroom. 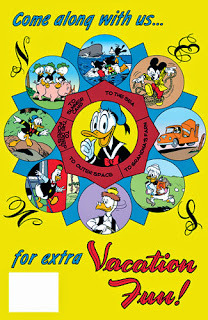 I leaped out of my desk when seeing the cover of “Donald Duck and Mathmagic Land”. It was a thrill viewing the cartoon as I had seen only pictures of it. A nifty cartoon that combined math concepts with my interest. After we played soccer, my friend Ian had arrived from a dentist appointment, he asked me what he missed in class. 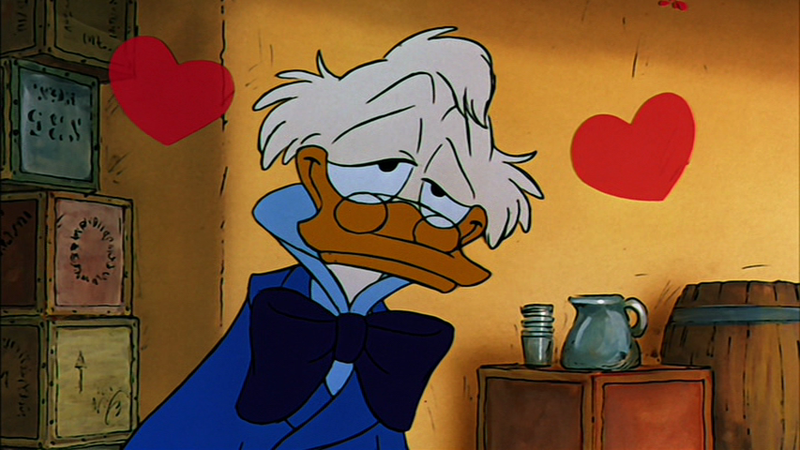 My friend Spencer said that we watched an Uncle Scrooge cartoon, and I corrected him that it was Donald. One thing that irked me at that time was how people would confuse Uncle Scrooge with Donald. 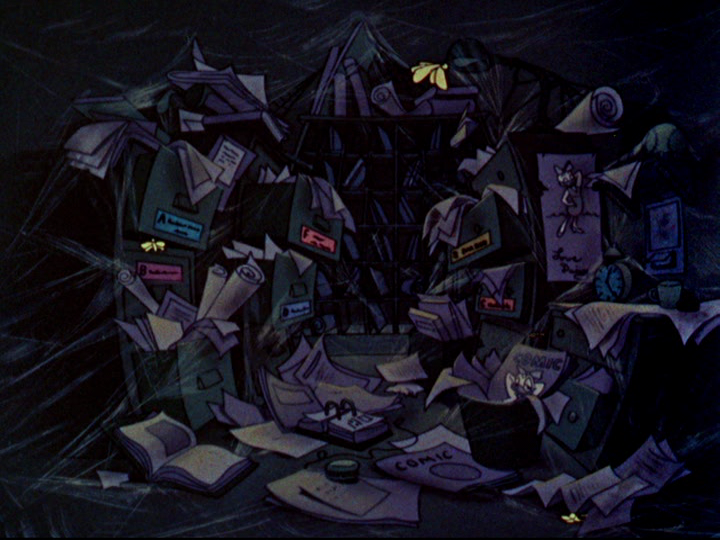 The Narrator (Paul Frees): Look at the condition of your mind: antiquated ideas! Bungling! False concepts! Superstitions! Confusion! To think straight, we'll have to clean house. A pin-up drawing of Daisy(!) in Donald's mind. I always felt this was a reflection of my mind as I had difficulty in school, but I recalled inane knowledge about my interests. 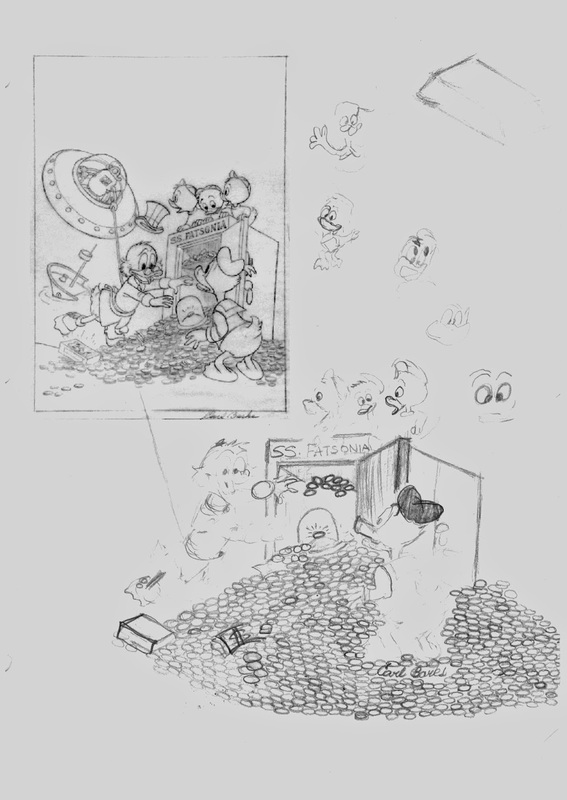 I visualized this scene of when I needed to focus on complex concepts in class. 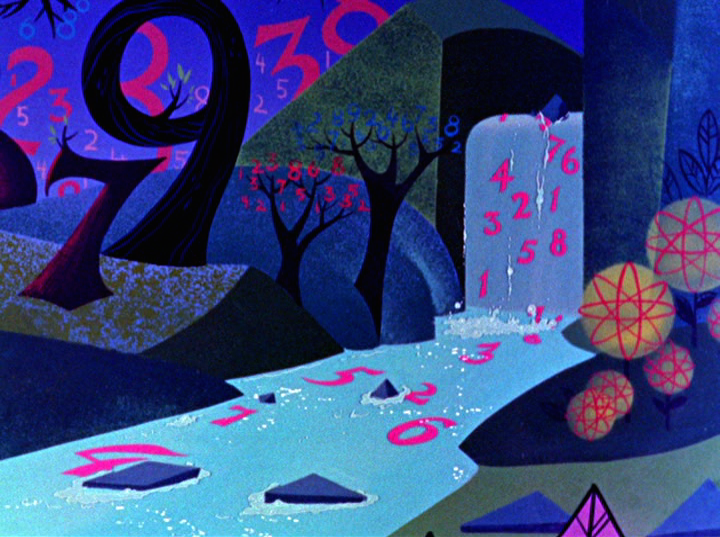 The background artists imaginatively incorporated numbers in the background. 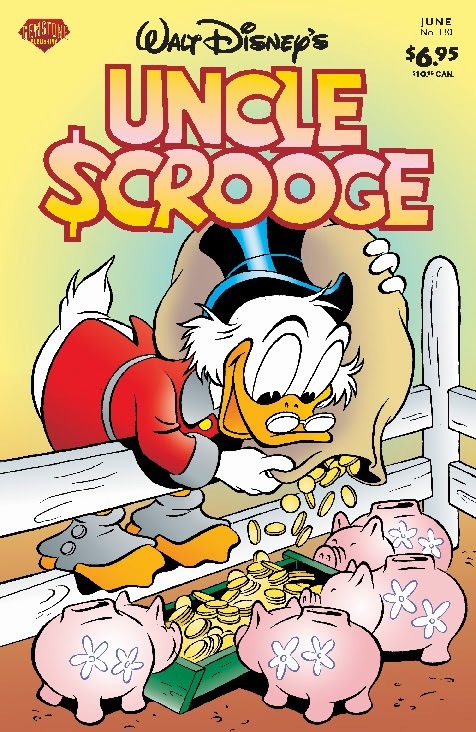 Each night I would unwind by reading a chapter from "The Life and Times of Scrooge McDuck". It was “Chapter 11: The Empire Builder From Calisota” that I found to be the most intriguing as his personality shifted to the hardened, villainous character he was when Barks first introduced him to the world. I found it heart wrenching how once he accomplished his goal of being the richest Duck he loses his family. I thought had he not made that immoral decision in securing his position of the wealthiest. Would it have resulted in him in cutting all ties with his family? We went to the school library to select a book for quiet reading. This one day we had a found a book on the planet Uranus. You can guess the pre-pubescent humor we reviled in. Yes, we were fascinated with the word – Uranus. We purposely read out the name “Uranus” and laughed relentlessly at the name of the planet.” Another session of giggling erupted when asked Mr. Pugh what we were reading, we told him Uranus. For an inexplicable reason I or one of our classmates brought out “The Sesame Street Dictionary” from the bookshelf. Although the subject was beyond our age level nonetheless we found it interesting. 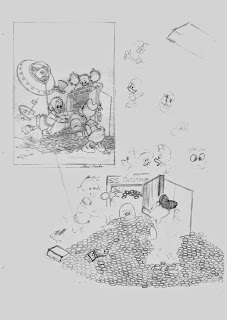 I was amazed by the diverse cast of characters featured in the book from the popular (Ernie, Bert, Oscar, Big Bird, Cookie Monster, Grover, and Kermit the Frog) to the obscure (Guy Smiley, Prarie Dawn, Sherlock Hemlock, Herry Monster, and Don Music) In first grade I signed out the book but I was perplexed how there was no narrative. We discussed a rumor of Bert being killed off. 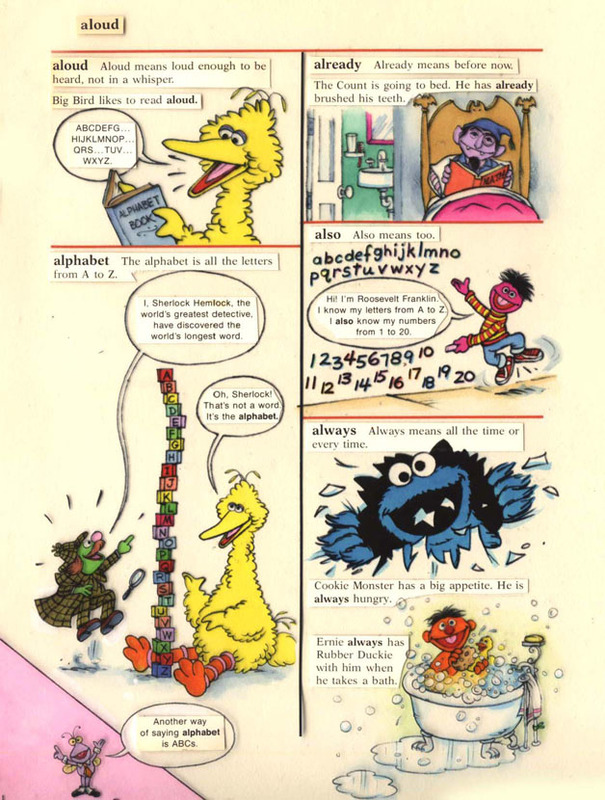 A sample of the layout of "The Sesame Street Dictionary". When we went back to class Ian and I searched for supplies in Mr. Pugh’s cabinet, we discovered a video – “Disney Sing-Along Songs: Under the Sea”.We shared our find with a group of classmates who were curious about what we were giggling about. The video reminded us of the eponymous song which was lampooned in “Homer Badman” where Homer imagined living underwater. It led to a couple of us singing Homer's rendition of "Under The Sea". By the end of the day, my stomach ached from ceaseless caterwauling. 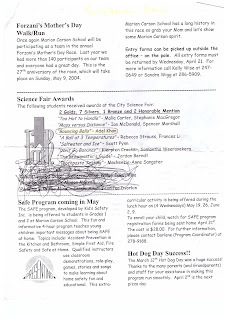 On February 5, 2004, we presented our projects once in front of our class. When it was my turn to talk about my project “Bouncing Balls”, Jare one of my classmates asked Adel how far did your balls bounce? Once he said that I could not contain my composure. We presented in the gymnasium after recess and later in the evening. It would be a few weeks later until we would discover who would be the representatives of the Calgary Youth Science Fair, but I was preoccupied in enjoying the "The Life and Times of Scrooge McDuck". Out of good conscience, I couldn't keep Joey's comics for a long time. The night before I had to return the comics Joey lent me I was reading “Chapter 8C: Hearts Of The Yukon”. I remember listening to “Desperado” by the Carpenters as I read the story. 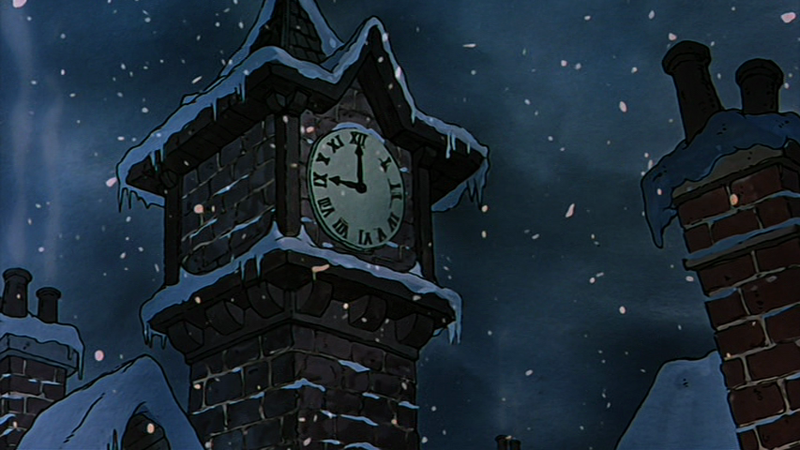 The song aptly fit the faltering relationship between Scrooge and Goldie. 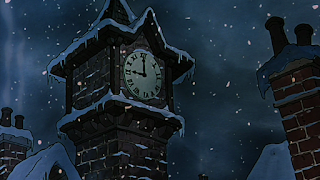 The final lyric “You better let somebody love you, before it’s too late,” supported the notion of how Scrooge was to reveal his desire for Goldie in the burning Blackjack Saloon before being knocked unconscious from a fire hose. It was a bittersweet moment as I could not wonder what would have prospered had he conveyed his feelings towards her. I preferred their relationship over Donald and Daisy’s as their relationship was one-sided. The fact that they both had rigid hearts and could not openly display their affection was appealing. 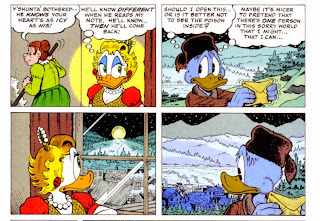 Don Rosa could be more explicit with how he handled their relationship, as he did not have to deal with the confines of censorship. 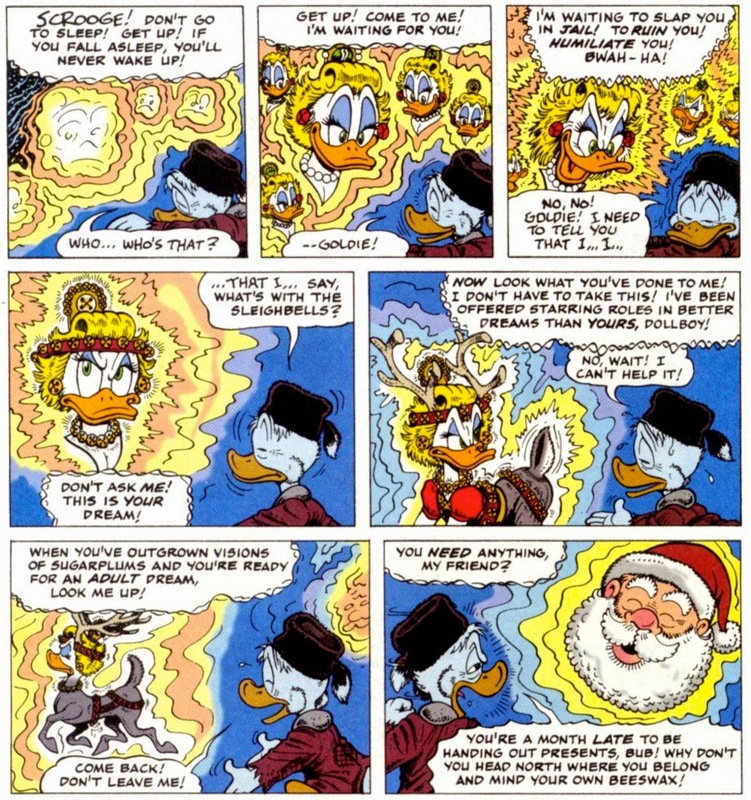 The lyric "Don’t your feet get cold in the winter time?” alludes to how Scrooge’s imperceivable fortitude conquers the frigidness he is experiencing, while visiting Glittering Goldie. The set of lyrics "The sky won’t snow and the sun won’t shine. It’s hard to tell the night time from the day" describes the constant bleakness as he was making his way through the storm.In the lower panel, you can sense the struggle he is putting up against the storm by his gesture. Don Rosa's drawing makes you feel as you are battling the elements with him. The colours of blue and purple add to the coldness. Scrooge's hallucination of Goldie as a reindeer was humorous, yet odd. 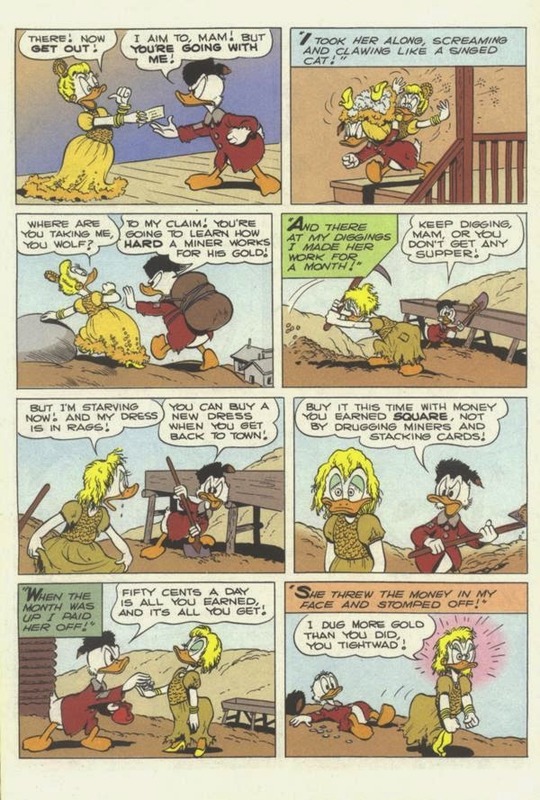 The lyric "Your prison is walking through this world all alone" is applicable to both Goldie and Scrooge as they both have put up walls preventing each other from being hurt. 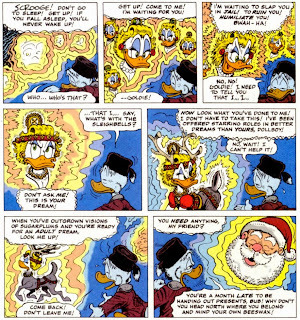 In the final tier, Don Rosa through different perspectives conveys how they both feel the same loss. Sadly I had to return the issues that I had borrowed from Joey. It was “Valentine’s Day” that I picked up “Uncle Scrooge” #325 as it reprinted, Carl Barks classic “Back To The Klondike”. I never owned a copy of the comic. A frequent writer to the Uncle Scrooge letter column, Joe Torcivia, commented: ”Like a cherished holiday TV special, [“Back To The Klondike”] should return regularly to thrill each new crop of readers,” which conveyed my sentiment. I read the story online with my dad, however, it was not the same experience. The tale included the infamous scene of him recalling what happened between him and Goldie. I was enamored with how Glittering Goldie drugged his coffee in order to obtain the Golden Egg Nugget. How he inflicted over the top violence upon the locals in the bar was fantastic. 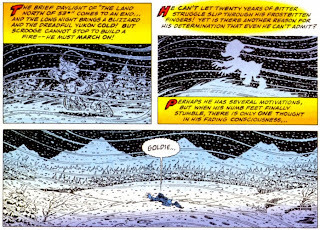 It was ironic that at the time in Calgary, Alberta there was deep snow, which matched the panel of Scrooge surrounded in a snowdrift. White Agony Creek was reminiscent of the scenery in Calgary. 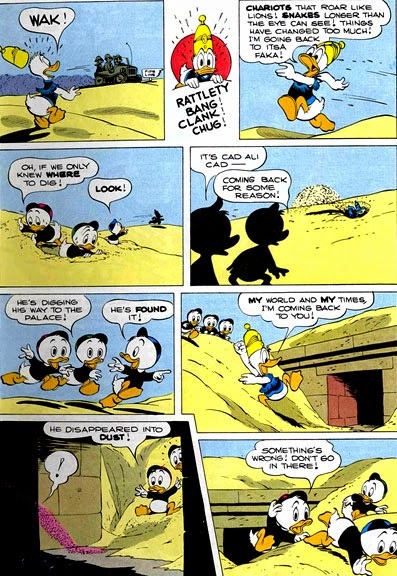 It made me appreciate the great lengths Carl Barks went to make sure the backgrounds were accurate to the story’s setting. Carl Barks looking back on the morality of the scene said: " Scrooge picked her up and carried her out to his claim and made her go to work. It didn't look like kidnapping, yet it was. He was taking the law into his own hands and that is not lawful. And what did he do with her at night?” My interpretation was there were platonic undertones to their relationship. What was great was how he stirred up interest of what may have happened during the stint without going too much into detail. I had no qualms about the young Scrooge kidnapping Goldie being unethical. At that age, it was cool seeing him as an antihero, as you saw Goldie withering in her ripped clothes and tousled hair. Ha-ha-ha I loved this sequence so much it's scary! 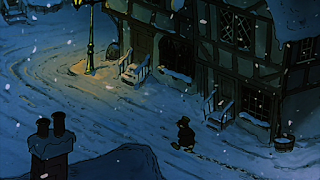 The DUCKTALES adaptation of the story appropriately altered the incident of Goldie willingly offer Scrooge to replace his nugget. For further reading on the adaptation, I HIGHLY recommend Chris Barat’s analysis. His style during this period was nice. As the characters had a 'soft' look to them. The censored pages include a gamut of emotions from scorn, seductiveness, and sorrow were striking that I traced many poses from here. The interplay between the lethargic Donald as he struggled to carry a crotchety Scrooge on his back while climbing the Chilikoot Pass was witty. 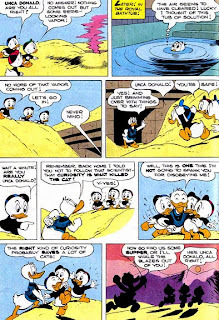 It was similar to the beginning of “McDuck of Arabia” (US#55) where he was excited in tossing moneybags, while Donald was intent on sitting on a chair. A few months later, I was having a conversation with my tutor who was from British Columbia. I asked her if she had seen the Chilikoot Pass? She told me she had. After she left, my mom asked me how did I know of the Chilikoot Pass? I told her I learned about it from “Back To The Klondike”. The story is still enjoyable as when I read it in my formative years. 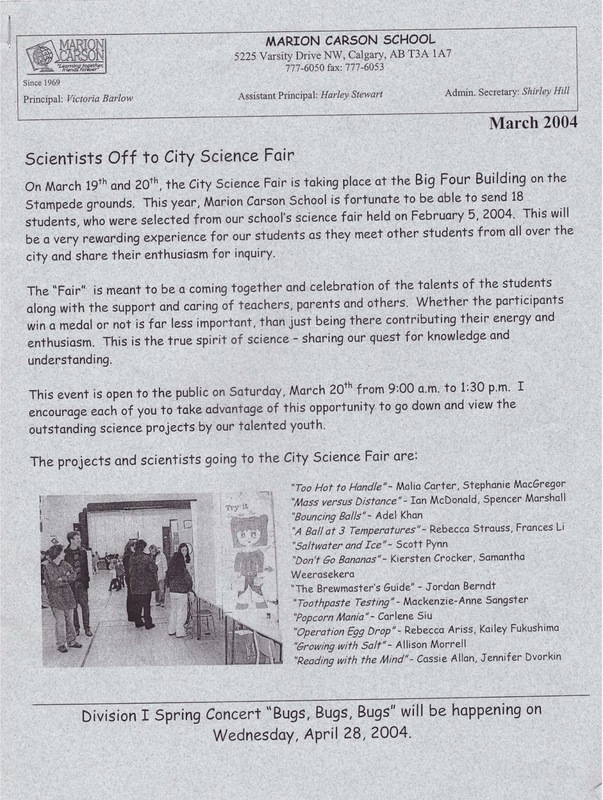 The Marion Carson School Newspaper announcing the City Science Fair. A couple of days later the list of qualifiers of the Calgary Youth Science Fair was posted outside Mr.Pugh's classroom. I remember how I made my way through the sea of 'grade sixers' to see if I made it. I scrolled down through the list with my finger and I saw my name listed there. Then as I was leaving I went back to check that it was actually my name. There it was! I was awestruck that I was among the many contenders along with Ian, Spencer, and many others. One of my friends Jamie he was heartbroken that his project was not selected to win. I felt guilty about having been one of the contenders as it wasn’t my intention to have been a part of it. 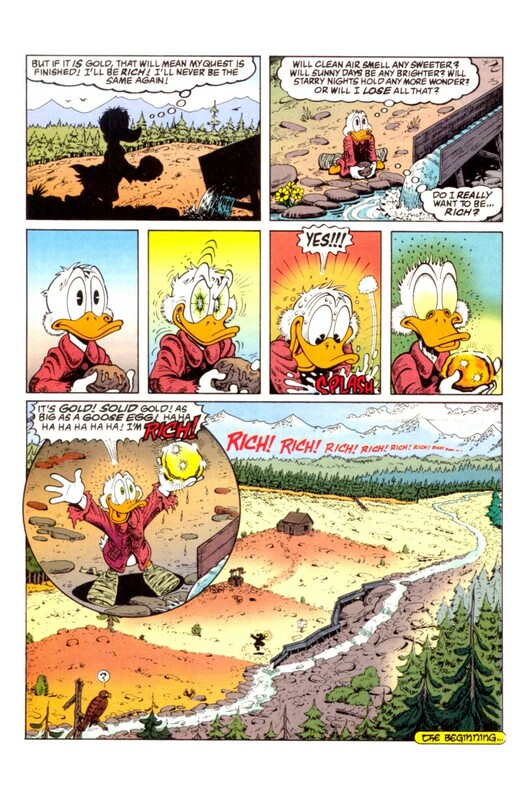 That ride from school I proudly told my mom that I would be participating in the Calgary Youth Science Fair evoked this page from Don Rosa's "The King Of The Klondike. In the second tier, the secession of expressions as Scrooge's mood elapses from contemplation to greed was captured marvelously. There was the day I wanted to borrow a VHS entitled “Donald Duck: Kids Is Kids”. The cover was a still from 1952 short "Lucky Numbers" or as I called it "the one that takes places at a gas station". I called all branches of “Rogers Video” to see if they carried the video. I was disappointed that none of the locations had it. The following day I walked to the library, to pay Joey a visit and ask him if I could borrow one of his volumes of "The Carl Barks Library". On the way there I had a longing for a Duck related surprise if it was a comic book or videocassette. When I arrived at the library I went to the reception to talk to him. We had a brief conversation before he asked to be excused, which I allowed. At the age, I was not aware that our discussions may be distracting him from completing his work. I treasured our discussions about Carl Barks and other Disney artists. I would occasionally bring the subject about the Ducks up with my friends, but they did not share the level of enthusiasm as I did. Remember this was before I entered the world of blogs and forums, so I did not have anyone to discuss deeply the topic. 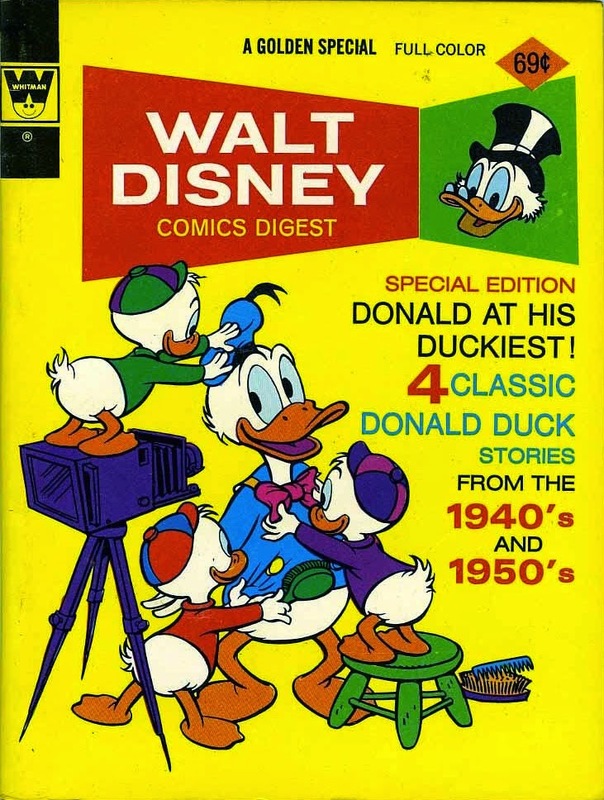 When Joey returned he held a copy of "Walt Disney's Comic Digest" #44. Upon seeing the comic I did a "take" that exaggerated a Tex Avery cartoon. He explained how he found a spare copy while cleaning out his house. I was eternally grateful for him giving the comic to me. Upon walking home, I was mesmerized by Tony Strobl's drawing and the clever caption. I always liked the layout of the digest's cover with a Disney character in the corner. The quality of the digest was not in the greatest of shape, but I treasured it nonetheless. I got a real kick of seeing the stories muddily-reproduced in the digest. 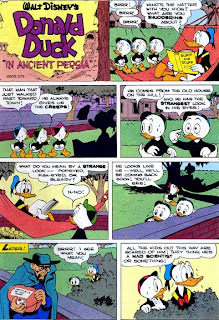 There were two stories "Donald Duck In Ancient Persia" and "The Pixilated Parrot" I had never read before. The covers that originally followed the stories were also reprinted. 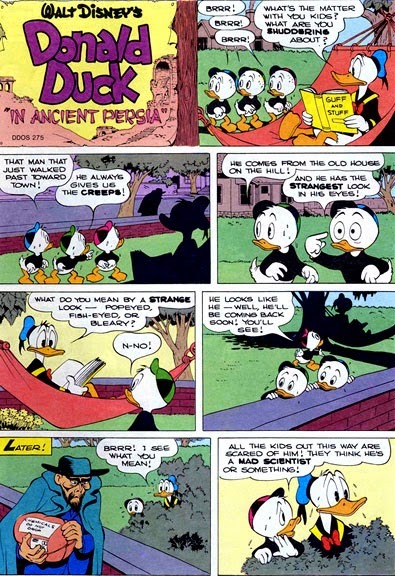 "Donald Duck In Ancient Persia" was the first story of his where I was really riveted. The opening panel of the nephews looking at the ruins of Persia set the foreboding atmosphere. It was eerie how Prince Cad Ali Cad left alone in the bewildering present, happily commits suicide. Barks revisited the concept of a character using powders to return to his former life in 1967’s “King Scrooge The First”, his last story written but drawn by Tony Strobl. The scientist is an actual human being added to the chill factor. The scientist’s elixir, when invoked upon on human ashes, brought people to life fascinated me. What was even more foreboding was how he abducted the Ducks. That’s a joke, son! King Nevvawaza poked the scientist in the eye as he repeatedly asked about how his people were desiccated, reminded me of when Moe would inflict it upon Larry or Curly. His illustrations of the characters drying up were spooky. After all, Donald endured, he was kind to his nephews it made the story upbeat. In "Donald Duck and The Pixilated Parrot" his gesture of giving Uncle Scrooge the parrot as a birthday present was thoughtful. 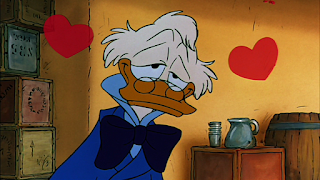 Scrooge's reaction ("Me with a bird to support. I should give myself to the poor farm.) was priceless as he refused his nephew's present. The hi-jinx the parrot present as he endlessly enumerated numerous items was a good running gag. It was strange seeing his money stored in a vault inside a building instead of his Money Bin. 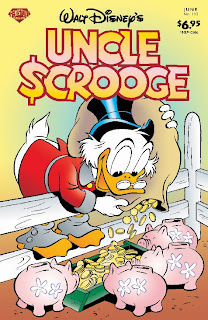 I found it humorous how Scrooge had to kick Donald in order to persuade him to retrieve the parrot from a flagpole. I thought that the story was finished once they brought Polly from the jungle. I forgot about the robbers who stole his money. How it took them an entire month to split the money between them. Later the evening, I went for dinner at "Pizza Hut". I looked at the final page before our order arrived. I was anxious that we would not have to wash dishes in compensation for payment as the Ducks did. Thankfully we did not! On Thursday, March 20 during the last class of the day we played games outside. As we were representatives of our school Mr. Pugh told us to be on our best behavior. It felt as if we were embarking on a secret mission and our duty was to uphold the trust. As I left the building I was on top of a euphoric high that I could not be knocked off from. 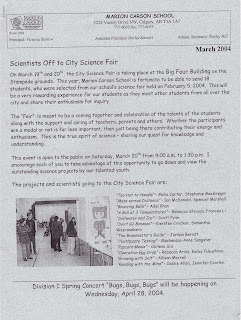 It felt special attending the City Science Fair while our classmates were in school. The feeling of being away from Marion Carson Elementary even for a day appealed to more. That night we ordered from Pizza Hut; The leftover pizza slices were my lunch for the next day. It's the only food that can be tasty whether cold or warmed. On Friday, March 21 I went with Ian and Spencer with another participant's father driving us to the Big Four Building. It felt like we were on the cusp of adulthood where we didn't need adult supervision as we went from one booth. I was excited to discuss my project with the judges that would pass by. I flipped through "Walt Disney Comic Digest" #44 and "Carl Barks Library I" book 1 was how I passed time. If I was bored I would visit Ian and Spencer. A booth sponsored by APEGA who distributed stickers made me proudly exclaim to my friends how my father was a member of the organization. Ian's mother picked us up from there and we stopped by Roger's Video because Ian wanted to watch a film as he had a basketball game the following day. The back cover from "Bugs Bunny - Truth or Hare". As mentioned in a previous post I enjoyed looking at the cover art of the video cassettes at Roger's Video. I was intrigued with which short the still of Bugs Bunny as Groucho Marx belonged to. An energetic participant in front of his project.